Don’t get me wrong, this girl loves it all. Gold, Silver, Platinum it all has a place in my world, but Copper… Something about this metal just resonates with me. Its warmth and depth and everydayness…is that even a word?? I love it polished up shiny or aged with that beautiful dark patina that only time can produce. It wears well with everything; you can dress it up or throw it on with your favorite jeans and T-shirt. Maybe that’s part of it, to me Copper is comfortable. It is earthy (well duh, it comes out of the ground), it is one of the few metals that when used in jewelry, doesn’t have to be alloyed with anything to make it sturdy. Just pure nature at her best. But…my friend Copper has gotten a bad rap over the years. It does have a that reputation…you know the one…that dark bluish green that can sometimes appear under your ring or bracelet…ummm…not so pretty right? Well, that is what I want to talk a little about right now. First of all…and this is important, these are called Copper Salts and they are absolutely harmless and a quite natural occurrence. They wash off fairly easily with soap and warm water. Copper Salts are the result of the natural acids in your skin reacting with the copper and starting the natural oxidation process of copper (or any other metal). The Copper Salts form on the metal and are are rubbed off onto the skin. What does the green tell you? The green color means that your skin has become more acidic and has dissolved copper from the jewelry piece faster than the body can absorb it. This usually happens when we sweat, when we are stressed or even when we experience dietary changes. 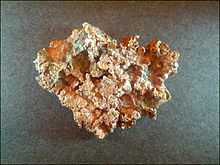 When the body is in a state of homeostasis, the copper is absorbed through the skin at the same rate it is dissolved from the jewelry, so there are no green marks. Did you know that your body actually needs a certain amount of copper, along with some other important elements to function properly? What does this little chemistry lesson have to do with us??? Well, I don’t like that little blue green band either…so, to help combat this little annoyance, I coat my copper pieces with Renaissance Wax, which helps a great deal with slowing down both oxidation and patination, which results in no blue green visitors!! YAY. Of course, the wax is not a permanent coating and with time and wear it will diminish, but it can be reapplied when necessary. Have a piece of jewelry at home that leaves a mark? Try a little bit of clear nail polish, you may find that it helps.